I’m a relatively recent convert to the notion that opera can be an accessible art form. NI Opera’s invitation to review some of their larger works, with their trademark outlandish modern sets and interpretations of the operatic repertoire. While Salome’s beheading of John the Baptist [spoiler alert!] and dance of the seven veils was certainly memorable, the performance that sticks with me is Turandot. Puccini’s last – and unfinished – opera that combines an emperor, a set of challenges for worker Calaf to overcome to win the hand of Turandot, the emperor’s despotic daughter, wrapped up in a tale of class divides and family reunion as Calaf recognises his blind father Timur. Director Calixto Bieito was behind NI Opera’s version – in conjunction with Théâtre Du Capitole and Staatstheater Nuremberg – and set the story in a factory manufacturing plastic dolls. Workers slaved away, while the owner looked down from his vantage point high above the factory floor. And all sung in English, which massively helps understanding the plot (though ruins the rendition of Nessun dorma). When the New York Met’s more traditional version – with dragon heads, bridges, and everything pretty much at ground level – was beamed into a local cinema I went along. Sung in Italian, it was a very formal presentation on a set that had been brought out of storage from the last revival of the show. The sound was noticeably out of sync with the singers’ mouths which rather ruined the big screen effect. But a couple of weeks ago there was a performance of Turandot by Handa Opera on Sydney Harbour with the Opera Australia chorus. The outdoor performance was being shown in cinemas – pre-recorded with no sync problems – and complete with a soundtrack of crickets gently rubbing their wings that was faded up during quiet moments to add to the atmosphere. Bringing theatre and opera performances to audiences sitting remote from the venue has become common place. 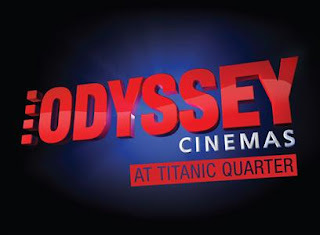 Many large world class venues and producers now extend their audiences (and increase their box office takings to fund these expensive productions) and most cinemas in Northern Ireland are showing a selection of plays and operas throughout the year. The ‘stage’ in Sydney Harbour included a huge fire-breathing dragon and a 18 metre pagoda. The Emperor didn’t enter stage left or stage right, but instead was craned into view above the chorus, sitting in a huge wooden throne. (He remained up there throughout, strapped into his floating stage, unable to take a bow with the rest of the cast at the end.) Projections behind and across the cast completed the visual imagery. An up and over garage door opened high up in the towering pagoda to reveal Turandot, level with her floating father. Over twenty minutes she was gradually lowered towards the mere mortals at ground level. Having won her hand, Turandot and Calaf were raised up before the tower revealed one last party piece and its top hinging open like a flower (bad analogy) to reveal the happy couple. A level of heightened symbolism not possible on a traditional indoors stage. In all three performances of Turandot I’ve seen, blind Timur’s slave girl Liù steals the show with her singing and compassion for the old man she cares for. Odyssey Cinemas at Titanic Quarter have a programme of live events, international cinema and even satellite Q&As with actors and directors. Over the next few weeks you can see Australian Ballet’s Sleeping Beauty (4 October) the Royal Shakespeare Company’s King Lear, the 25th anniversary West End version of Miss Saigon, Kenneth Branagh playing The Entertainer, Royal Opera House’s Così Fan Tutte [NI Opera’s Oliver Mears is heading off to become Director of Opera at ROH in February] as well as 1960’s Batman and Japanese steampunk classic Steamboy. And their regular anime screenings are back on 16 November with Your Name. Two amateur survivalists and a couple of dogs flee civilisation into the wilds of New Zealand as they put their wits against a police manhunt. 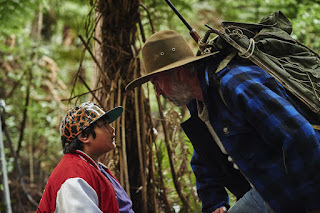 Hunt for the Wilderpeople sees an emotionally unintelligent old farmer Hec reluctantly heading to the hills with his overweight foster child as they try to outrun the wrath of the social services department. Time spent in institutions and foster homes as well as history of getting into trouble has developed a street smarts and canniness in young Ricky that he applies effortlessly to his new circumstances. 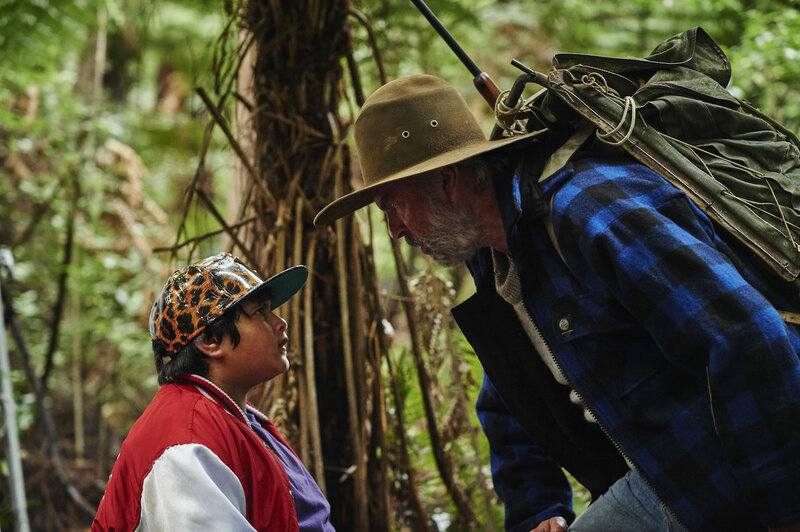 The rapport between Sam Neill and Julian Dennison builds over the 100 minute film, and it’s a shame that Rima Te Wiata’s madly eccentric scenes are so cruelly curtailed. A chase sequence – lucky for the director that they were driving a bright red pickup to contrast with the pale vehicles in pursuit! – temporarily ups the tempo before applying the handbrake and reverting to walking pace. The epilogue finally brought a tear to my eye, which shows how much of the story is played for laughs rather than reality. Hunt for the Wilderpeople is a harmless piece of fun. Writer and director Taika Waititi doesn’t allow his creation to become too profound. But late at night a full audience will titter along in time to the visual cues (so many sentences are finished with a visual gag rather than words), songs, haikus and one liner retorts. On the run and over the top, Hunt for the Wilderpeople is a quirky Kiwi comedy and is being screened in Queen’s Film Theatre between Friday 30 September and Thursday 6 October. 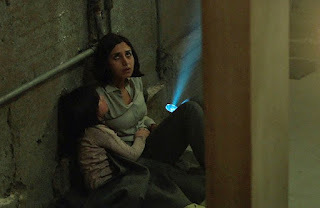 Under the Shadow starts out as a tense conflict-based study of a mother Shideh and daughter Dorsa (played by Narges Rashidi and Avin Manshadi) staying on in their Tehran city centre apartment while their neighbours flee the missile attacks and the father Iraj (Bobby Naderi) is drafted to the front lines of the Iran-Iraq war as a medic. It’s the 1980s and director Babak Anvari portrays a city where everything can be seemingly fixed with masking tape. But tape turns out not to be sufficient to cover over the cracks in the minds of those left behind when a hole in the ceiling disturbs the fabric of life. A lost doll is quickly followed by lost minds in this psychological terror which finds time to explore women’s rights, the consequences of political activism in Iran. At the start, household objects are given the sound of guns and bombs. But soon these sounds are being heard for real. The neurotic mother and her sullen child battle against the voices they hear and the sinister creatures who threaten the mental health of those left behind in the city under siege. While The A-Team-esque escape ending ruins the tension that has been building in your stomach for the preceding eighty minutes, if you like horror films with people desperately trying to escape the restraints of society and themselves, then head along to the Queen’s Film Theatre where Under the Shadow is playing between 30 September until 6 October. Even before any words are spoken the audience grasp the nature of the playful pair skittering about the stage. Amongst the hedonism, the playing hard and the wild dancing, we learn about the hard knocks they’ve taken along the way and gradually realise the uneasy nature of the teenage coupling. 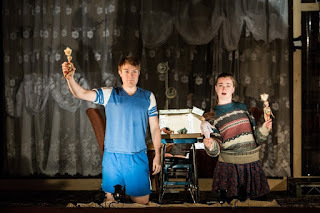 Ciarán Owens and Amy Molloy stay on set for the full performance, with one occasionally donning headphones or pottering around the deeper recesses of their small flat, complete with mannequin dummies representing other characters in their tales, while the other delivers a monologue. They do well to stick to the accent and deliver the unfamiliar dialogue while keeping up the hyper-energetic action (albeit peppered with a few depressed moments) for the whole performance. It must be exhausting. The vulnerability of these out of control lives is gradually exposed. At their closest they pull shapes in perfect harmony to the constant musical soundtrack that plays out of a 1980’s double-deck hi-fi. But this apparent unity covers over the chaotic dysfunction. Runt changes the subject every time Pig comes on too strong and it’s clear that she’s less and less comfortable with sharing the space and sharing her life with him. She longs for the tide to take her out and replace her with someone different, even “just for half an hour”. His violent reaction in the illusive Palace Disco brings matters to a head. Can the caged up and confused Runt escape and find freedom? Disco Pigs is a roller-coaster of a ride which conjures up empathy, disgust and a fascination about whether Pig and Runt can ever escape each other’s orbit. 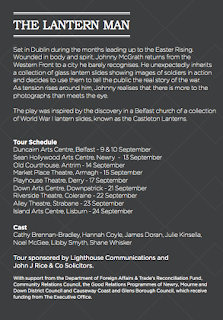 Reading Rep’s production played in the Lyric Theatre, Belfast between 14-17 September and is now touring Cork, Galway, Waterford, Birmingham, Glasgow, Sheffield, and Salisbury. All venues hosting performances of Disco Pigs should have packets of Scampi Fries on sale in the bar afterwards! 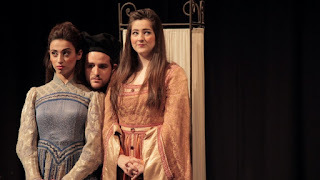 Resetting a play written in 1922 about events in the fifteenth century by dropping it into a different period, messing around with the parts and genders as well as performing it against a modern office set should have been a recipe for disaster. 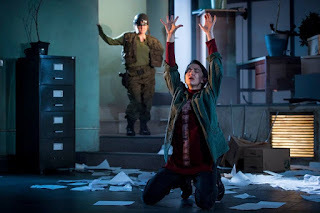 But the Lyric’s St. Joan works brilliantly and the audience suspend their disbelief in the collision of location, time and vernacular. Lisa Dwyer Hogg’s Joan of Arc is a mesmerising figure. She is steered by the voices of saints, yet cuts a contemporary figure as the apparent madwoman strides about the stage in increasingly androgynous clothes (that always bear a small cross) and casts her spell on all she speaks to. She foresees and empowers changes in the court, military victory and yet is an anti-establishment figure who turns the world upside down and the sorceress ultimately must be stopped. It’s a story of church and state, sometimes collaborating, sometimes conspiring. It’s a story of patriarchy and power, of generals and their armies, archbishops and their priests. Law and rules are applied without sense or challenge. The action flits across from France to England to observe both sides of the battle. What ties St. Joan together is the attention to detail. 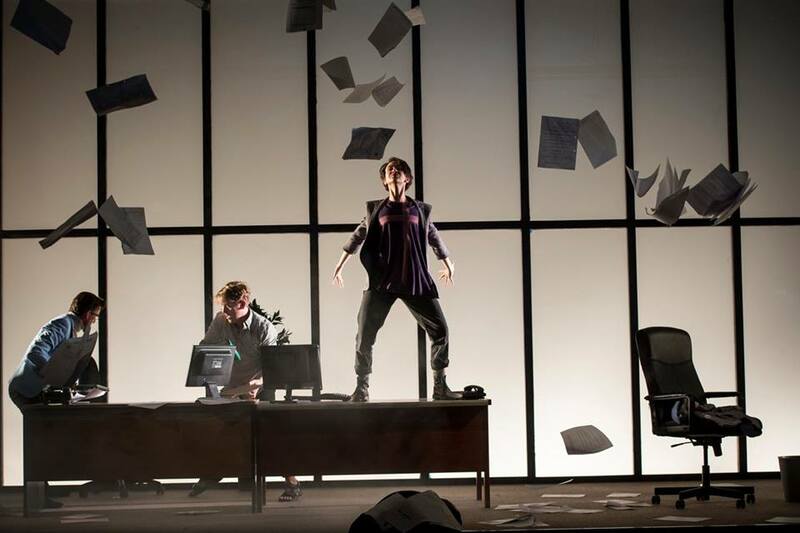 Grace Smart’s award-winning set both enhances the width and height of the Lyric’s stage. A water cooler on one wall mirrors the fire extinguisher (a subtle spoiler) on the other. Church bells are replaced with phones ringing. Heavy office furniture is flung around to create new spaces for each scene. The raised section at the back of the stage created an overlord’s eyrie from which those in power can watch the action without getting their hands dirty. The symbolism is deep if you have time to study it. 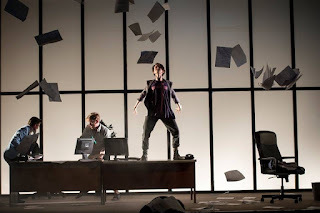 Ciaran Bagnell’s lighting design deserves a mention, overcoming the restriction of the suspended office ceiling and creating that familiar overly bright office environment. Nice clouds too. Snatches of dialogue seem very relevant in a post-EU referendum world, little Englanders and obsession with border security. Written in the wake of the Easter Rising, Shaw’s critique of the collusion of temporal powers and faith institutions seems quite contemporary in Northern Ireland as moral issues are fought over in court and across the island as corporate battles replace military conflicts. St. Joan runs at the Lyric Theatre until 8 October and is well worth seeing at least once and possible twice to properly wring out its brilliance. The evenings are drawing in, the mornings are cold, but the Belfast Comedy Festival is back from the 28 September for twelve days of chuckles to warm your soul. It’s fifth annual programme this year includes some real treats. The free Tenx9 comedy story telling session on Wednesday 28 September at 7.30pm in the Black Box will set you up with true stories of mirth and madness. And a week later on 5 October, the regular Film Devour evening of short films will take a comedic bent with its screenings and voting. Accidental Theatre are running a variety of shows in their Wellington Street city centre comedy command control complex on Friday 30 September and Saturday 1 October. Joe Nawaz’s Hey You! will tackle the problem of conspicuous consumption (30th at 8pm) and The Alternative Bedtime Stories from Gemma Walker and Sorcha Shanahan (30th at 9.15pm) are sure to keep you awake. Tim McGarry will be exploding myths and slaughtering sacred cows in his 1916 Goes Over the Top show in the Lyric on Sunday 2 October at 7.45pm. What’s funny about 1916? Why do we let our politics be led by events from 100 years ago? What’ll be remembered about today in 2116? 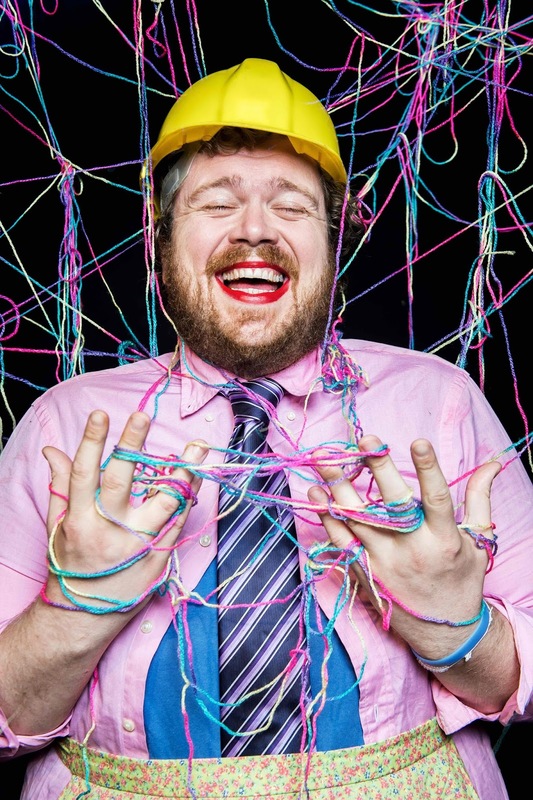 Paul Currie, fresh back from sweaty performances in the Edinburgh Fringe, is unleashing some new absurd material on the paying public in The Barracks (Exchange Place) at 7.30pm on Saturday 8 October. For the week of 3-8 October, Brenda Murphy’s play Two Sore Legs returns to the Grand Opera House. A one woman show telling the story of the playwright’s own extraordinary family circumstances. And don’t forget the award-winning stream-of-consciousness physical comedy genius Trygve Wakenshaw (Friday 7 October in The Mac), an invasion of Australian comedians, Jenny Eclair, The Horne Section and even a comedy walking tour. Full details on the Belfast Comedy Festival website. After its bruising breakup with Queen’s University and an unnerving though successful first year under its new structure and governance, the Belfast International Arts Festival is back, confident and less distracted with its 2016 programme. The Ulster Bank Belfast International Arts Festival – to give it its full name – runs from 11-29 October. Festival director Richard Wakely explained at the launch that the aim is to bring the international work to Belfast, and to showcase local work and artists that is of international standard, for example, Prime Cut’s award-winning Scorch (recently back from the Edinburgh Fringe). Quite a number of events include an element of audience participation beyond passive watching. Several hundred free tickets for paid shows are being made available to community groups and members of the public as part of the Ulster Bank’s sponsorship, along with some totally free events throughout the festival programme. Bending the Bard takes a sideways look at the enduring appeal of the Shakespeare on the 400th anniversary of his death. (If you need a quick refresher, Bruiser’s Complete Works of William Shakespeare (abridged) is in the MAC until 22 September and is then touring Ireland.) Watch out for the free Micro-Shakespeare sessions hitting the City Hall grounds (Saturday 15) and Girdwood Community Hub (Sunday 16) which will allow children of eight and over to become a Shakespearean puppeteer. Watch out for Trolleys, a street ballet for five high octane supermarket trollies with their humorous and anarchic performance, that will be in the same locations. Amanda Coogan’s multi-media Run to the Rock (Thursday 20–Saturday 22) combines sign language, performers from Northern Ireland and South Africa, digital sound and live image streaming to explore global themes of continuing relevance in Shakespeare’s texts, inspired by the Robben Island Bible (a copy of the Bard’s Complete Works that was smuggled into the South African prison). Nineteen Sixteen looks back at the events on this island and across Europe. Dance show Butterflies and Bones: The Casement Project (Thursday 13) looks at belonging and becoming through the life of Roger Casement. The Fever: Roger Casement in the Dark Places (Wednesday 19) brings together performances of new dramatic work by Fintan O’Toole along with new music and the trial speech that was written by George Bernard Shaw for Roger Casement to deliver at his trial. A century since limited women’s suffrage was introduced, 100 Years of Emancipation for Women – Where are we now? (Tuesday 18) asks how far women on the island of Ireland have come in relation to political empowerment (women are 27% of MLAs and 22% of TDs despite being 51% of the population), health and reproductive rights. Catriona Crowe and Fionnuala Walsh will be joined by Clare Bailey and Allison Morris. 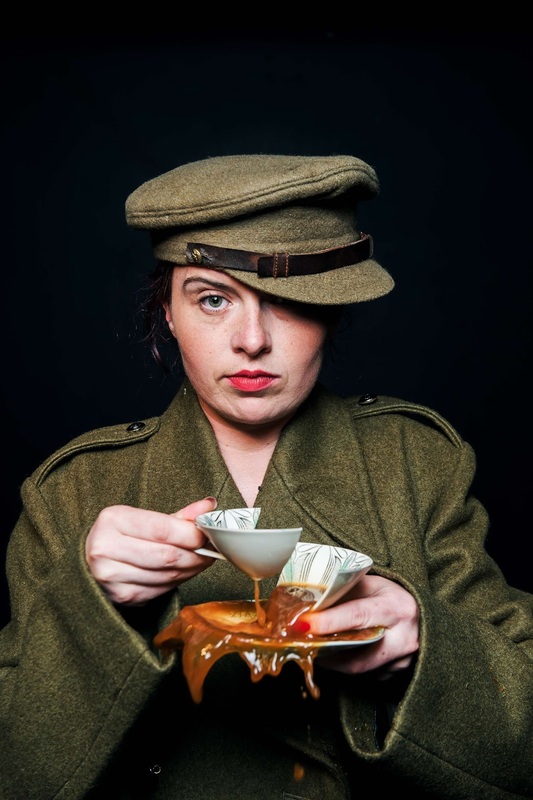 Belfast Rising by Brassneck Theatre Company (Tuesday 25-Saturday 29) uses story, song and visuals to uncover the legacy of women and men connected with Belfast who would rally and strike in pursuit of independence. World in Motion explores the human face of the migration crisis through film, theatre and word. The QFT are screening a short season of films: After Spring (following two refugee families in Zaatari refugee camp), The Music of Strangers, Flotel Europa (the director’s own story of fleeing 1990s Yugoslavia for Copenhagen), Walls (exploring the consequences of division globally through walls), #MyEscape (footage shot by refugees fleeing Afghanistan, Syria and Eritrea), Lampedusa in Winter (how refugees have become part of the island’s identity) as well as a selection of shorts from Mairéad McClean looking at Irish memory, migration and identity. David Greig’s new version of Aeschylus’ The Suppliant Women is being performed by a huge local cast in the Grand Opera House on Friday 21 and Saturday 22 October. The original play has at its heart local people arguing for their lives. Those resonances jump into modern times as fifty women leave everything behind to board a boat in north Africa to flee across the Mediterranean. Who are we? Where do we belong? Who will take us in? Author Charlotte McDonald-Gibson, author of Cast Away: Stories of Survival from Europe’s Refugee Crisis, will be in conversation with Peter Geoghegan (Wednesday 12 at 8pm), discussing her book’s insight into the EU’s chaotic and mismanaged response to the crisis. The following evening (Thursday 13 at 7.30pm) Dr Rebecca Schaaf will deliver a lecture for the Royal Geographical Society that explores the complexities of the refugee crisis, placing it in a global context and considering the deeper causes and longer term implications. Labour MP Yvette Cooper is delivering Amnesty International’s annual festival lecture on Thursday 20 at 7.30pm. Her remarks will look at fixing the refugee crisis and why the UK should do more to help those fleeing violence, conflict and persecution. Followed by Q&A. The 2016 Festival opens on 11 October with a free evening of poetry, music, drama and imagery at 7.45pm in The MAC. In Dreams Begin Responsibilities promises to be a celebration of reconciliation on the island of Ireland over the last hundred years. Two weeks later, the Festival closes with a series of concerts by the flamboyant artist and performer Taylor Mac. His concerts on Tuesday 25 and Wednesday 26 will feature his take on the music and culture from 1896 through to 1926 while the closing concert on Saturday 29 October promises to be “a ten decade spectacular” racing through from the Battle of the Somme and Easter Rising in 1916 to today in 2016. A live band, dazzling costumes and a lot to see, listen to and think about. After last year’s AniMotion show which projected live-drawn images on the front of Belfast City Hall, Customer House Square Ormeau Park will be transformed into a magical neon oceanic seabed on Sunday 16 from 7pm for the Irish premiere of Mù with sea creatures swimming amongst the audience as well as over their heads in a fabulous fusion of light, sound and acrobatics. Free tickets must be booked. Sarah Gordon’s first play A Sinkhole in Guatemala is being performed in Cultúrlann (Friday 21 and Saturday 22 October). A hole opens up, but where will it take you: a story about finding your way. Kabosh Theatre’s new play Green & Blue (Friday 21 and Saturday 22) looks behind the uniforms of RUC and An Garda Síochána officers patrolling the border at the height of the conflict based on an oral archive of officers’ testimony. The dance programme includes jumping, an immersive and participatory evening of community building (I’m genuinely scared of this one), and a double bill from artists in residence Oona Doherty and Leonie McDonagh. Enjoy a nice cup of Suki Tea at Belfast Open Studios as Visual Artists Ireland throw open their doors on Saturday 22 October to show visitors how artists get from an initial idea to the finished exhibition. An exhibition of David Sherry’s work is being hosted at the Golden Thread Gallery from 6 October. He takes a playful approach in his drawing, painting, photography and video draws attention both to the ordinary events of everyday life and the intricate structures of the art world. On Sunday 15 at 1pm he’ll be giving a talk about his exhibition. This time tomorrow the Cathedral Quarter will be buzzing with families as tens of thousands of people enjoy the hundreds of free Culture Night Belfast events planned for the balmy evening. 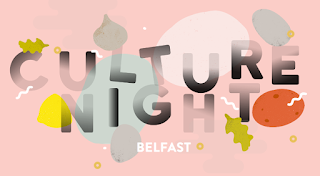 The full programme is available on the Culture Night Belfast website, but here are eight events/locations plucked out for your delight. Culture Nights in other towns and cities across Ireland can be found on the central website. Between 4pm and 9pm, Oxfam Ireland will be hosting Write to Refuge in Redeemer Central (101 Donegall Street). It’s an interactive exhibition highlighting the stories and plight of people forced to flee their homes by conflict and persecution. Authors like Glenn Patterson, Bethany Sawson, Shelley Tracey and Colin Dardis will share their written response to beautiful photographs of people on the move around the world (7-9pm). You can write your own reflection or make and decorate a paper boat with a message for our politicians about the refugee crisis. There’ll be a live-tweet-along screening of ET in the same venue at 4pm and a recording of the BanterFlix Podcast at 8pm. 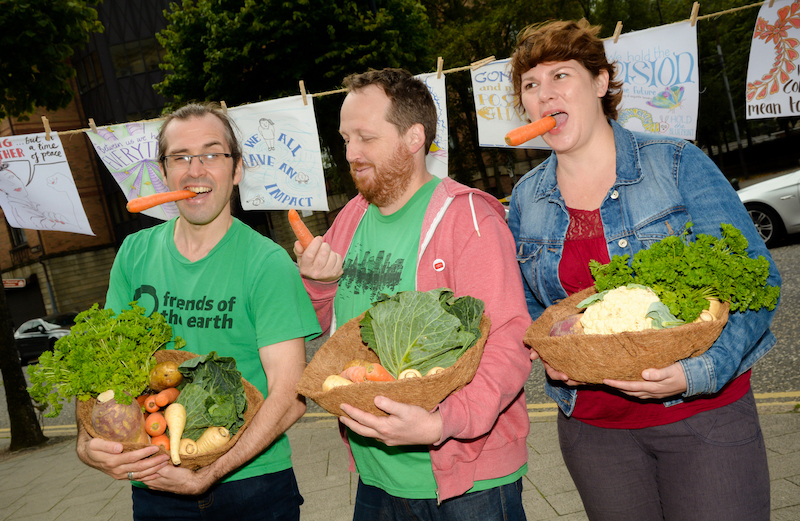 Food-waste campaigner Pascale Robinson will be ‘Breaking Bread’ in an attempt to feed 5,000 Culture Night attendees as Donegall Street is transformed into an outdoor dining venue from 3pm onwards. The tasty communal curry will be made out of 1.5 tonnes of surplus produce from fourteen local farmers that would otherwise have been binned. Compostable plates and cutlery complete the sustainable feast. The vegetables will have been prepared at Chop and Bop events across Belfast on Thursday afternoon. 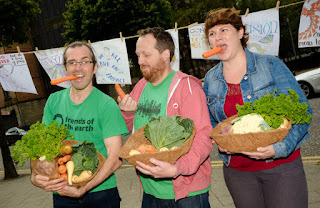 Support from Friends of the Earth and Belfast Food Network along with Belfast Harbour’s continued sponsorship of CNB has enabled this large scale food sharing to be part of the programme along with other art, comedy, music and street theatre. Amnesty’s virtual reality headsets in North Street (6-8pm) will transport you from Belfast to the devastated streets of war-torn Aleppo in Syria. Gain a new understanding and empathy by viewing these apocalyptic scenes from 360 degrees with footage and audio captured by Syrian citizen journalists. Katie Richardson and her remarkable Open House Choir are performing with the Marching Band Ensemble on the Electric Ireland Stage in Buoy Park at 5.30pm. (They’re back singing in the Victoria Square pergola at 8pm.) The Ulster Orchestra http://culturenightbelfast.com/events/info.php?x=16&e=361 will follow at 6.30pm and the Belfast LGBT Quire at 7.30pm. And if you’re impressed with the orchestra, you can meet the instruments up close in the Ulster Orchestra Instrument Petting Zoo at 7.30pm. The live musical accompaniment to episodes of Lily’s Driftwood Bay is always a treat: 5-6pm in the Black Box. The music in St Anne’s Cathedral will rotate every hour. Eurovision’s Molly Sterling will be singing at 3pm, Iain Archer at 4pm and the big sound of the Ulster Youth Jazz Orchestra at 8pm. And if you want something to sooth your soul away from the busyness of the streets, try Chorale Evensong at 5.30pm or the chanted Sung Compline at 9pm. And I’ve no idea how the cast never mind an audience are going to squeeze into Keats & Chapman bookshop on North Street, but some aspects of Tinderbox’s new production What We’re Made Of (review) will be there after 5pm. Bet their new star Hen makes an appearance! The now annual Slow Bike Race will make its unhurried way up Academy Street, starting at 6.30pm. He/She who shall be last … shall be first! And before that, the inaugural Belfast Pantomime Horse Race will take place in Royal Avenue at 6pm. Bruiser Theatre Company’s adaptation of The Complete Works of William Shakespeare (abridged) combines their reputation for minimal sets and prop-tastic madcap action in this humorous romp through the bard’s best bits. It’s a thoroughly modern show with contemporary references, visual humour, recognisable memes and an in vogue The Great Roman Bake Off. All of the plays are covered: history, tragedy, comedy, the problem ones and even the sonnets. It’s quite a feat to keep the energy up with excerpts and loose approximations of the Avon dramatist’s work, the majority of which are alien to the audience. 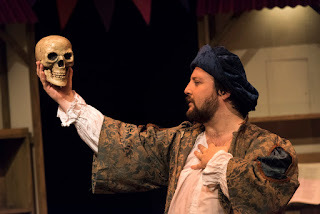 But no matter your level of familiarity or ignorance, so many phrases from Shakespeare remain in modern parlance that you’ll never be lost for long with Keith Lynch, Gerard McCabe and Michael Patrick on stage to guide you. In fact, the cast give such a comprehensive overview that you’d swear they know some of the plays backwards. 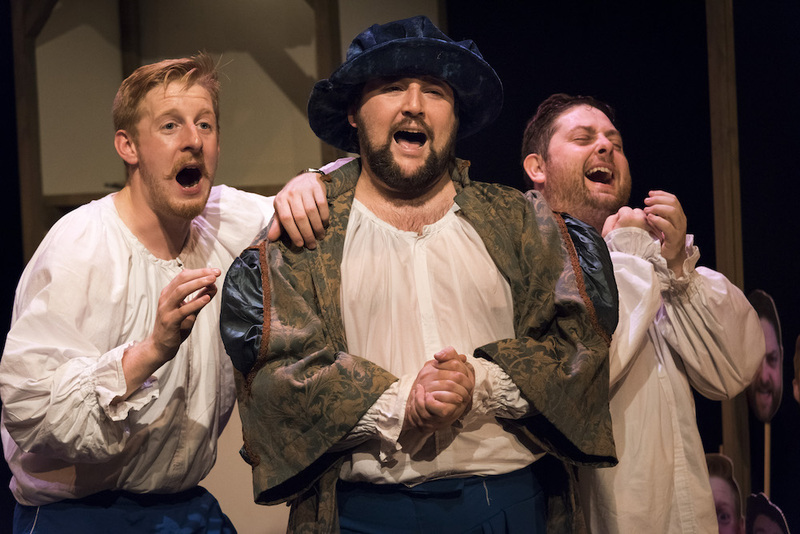 In keeping with the original Elizabethan texts, there’s a fair amount of vulgar language, boke and humour as the 37 plays are brought to life over 97 minutes. It’ll appeal to young and old. While Keith Lynch’s “To be or not to be” speech is deliberately ruined, Gerard McCabe manages to squeeze in a spine-tingling moment away from his comic asides and ad libs with the audience. Unlike Bruiser’s 39 Steps which was trapped in a particular period, The Complete Works succeeds in borrowing distilling ideas from across the cultural panoply with the men in tights performing gangsta rap, picking up puppets and dropping into song and Ulster Scots when it suits. It’s laugh out loud funny throughout. And like Cabaret, the cast pick up instruments to accompany their show. In perhaps the first play that I’ve been written into – for one morning only! – Bruiser’s version of this Reduced Shakespeare Company-inspired pantomime is fun, physical and even a little educational. Half an hour after the play finished and I’m still feeling breathless … and I was only sitting in the audience. 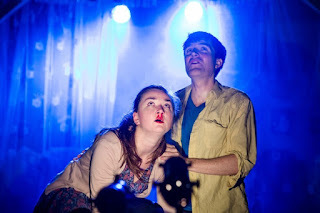 Tinderbox specialise in new writing and last night’s premiere of three new one act pieces was certainly a treat. An ensemble cast of four slipped in and out of diverse characters under the title of What We’re Made Of. Daragh Carville’s History sees two old flames rekindle their friendship. With the help of two stage hands (Nicky Harley and Rhodri Lewis) who double as inner voices, the playwright plays with time and we see renewed passion grow between Emma (Kerri Quinn) and Declan (Patrick McBrearty) while dipping in and out of significant moments in their past relations. If you turn lives upside down to pursue the only person you’ve really loved will you find enduring happiness and stability amongst the guilt and latent insecurities? Moods change in the beat of a broken heart in this intense and pared back character study that subversively allows the characters to speak in cliché while forcing them off the normal script as events spiral to their conclusion. After the interval, the audience were introduced to Hen (played by Rhodiri Lewis). In this short woolly performance, stereotypes of gender and identity were unravelled as the audience began to interact with the gestures and mostly non-verbal prompts of the bearded gender-neutral character to his knitting circle. [Hen is the Swedish gender-neutral personal pronoun used as an alternative to Han (he) and Hon (she).] Wearing a spangly skirt, pinny and tie with a hard hat to complete the look, Hen is a character with legs (and a beard) that we’ll hopefully see more of in the future. The third performance Hiatus is a collaboration between playwrights in Croatia and Northern Ireland (Jonathan Bailie, Vedrana Klepica, Ivor Martinić and John McCann). The audience return into a completely reoriented theatre space, though the components of Niall Rea’s set are familiar in the war torn landscape. Party poetry, part play, part meditation on war, there’s a lot packed into three vignettes, and space is made for comedy amidst the conflict angst. Who are we when our world falls apart? Acts of defiance and gender are explored as the story behind a famous photograph is dissected and we are reminded that the explanations attached to a single frame can misrepresent the original snapshot. A coalition is formed in a coat. A ridiculous but brilliant allegory. The intertwining of the mundane, human desire for stuff with an imagined better way and the oppression of conflict and man’s continual attempt to keep woman out of the narrative. Not to mention the creation of Maslow’s hierarchy of needs for the modern mercenary. All three works live up to the Tinderbox’s promise of experimental theatre. If anything there’s nearly too much squeezed into the two hour running time (including interval). And putting milk into a cup followed by the tea bag and then the hot water is just wrong! What We’re Made Of is experimental, ambitious and incredibly engaging. The three pieces show off the range and ability of the cast and the back stage team at Tinderbox. While Quinn and McBrearty’s disco moves in History are a joy to watch, they also point to the hand of director Patrick J O’Reilly. And the crisp dialogue and sparse silences indicate that the red pen of dramaturg Hanna Slättne has homed the writing. While Niall Rea’s set is simple, and much of the production is exposed, this belies the complex layers of cues, lighting effects and Katie Richardson’s pumping soundtrack. What We’re Made Of runs in the Crescent Arts Centre until 23 September. Three performances not to be missed or forgotten. Back in 2013 a box of old glass lantern slides were discovered in the organ loft of Alexandra Presbyterian Church. Research showed that the slides were copies of photographs provided by families in Castleton Presbyterian Church. They depicted relatives serving ‘at the front’, images of both men who survived and men who were killed in action. You can find out more on the Castleton Lanterns website. The discovery inspired theatre critic turned playwright Jane Coyle to write a fictional story: The Lantern Man. Johnny has returned home to Dublin wounded in the World War One battlefield in France. Inheriting a set of lantern slides taken by a relative employed as an army photographer, he screens the images in a local club in a bid to give a glimpse of loved ones to families. 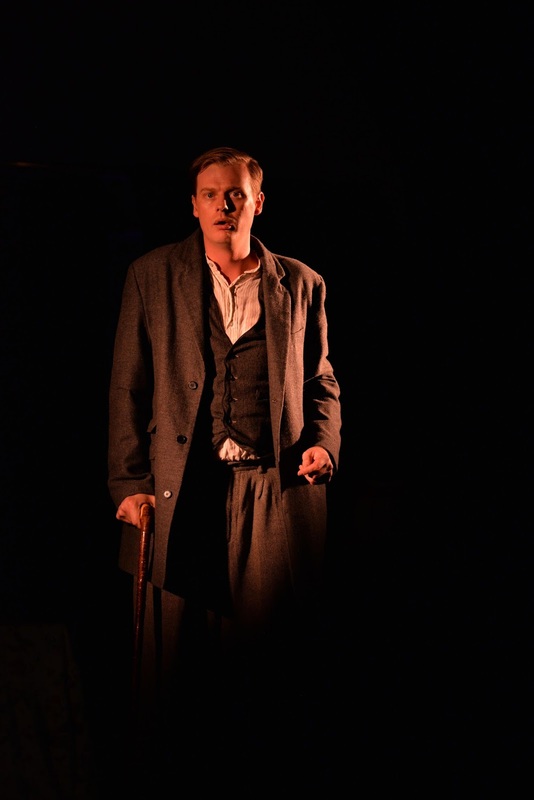 Set in the months prior to the Easter Rising, the play highlights the criticism faced by some returning to Ireland having “fought for the British”. It also draws attention to the discomfort felt by those in authority about revealing the true conditions of war to families back home and to potential new recruits. Johnny (played by Shane Whisker) finds that his lantern show stirs up negative emotions in some viewers, while giving others hope that they can find out the truth about their dead children. 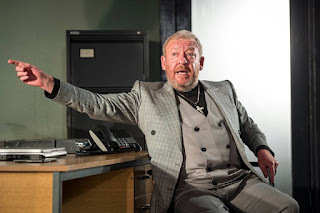 These twin narratives – along with the exposure of several secrets in Johnny’s past – and family dynamics that wouldn’t look out of place in an episode of Eastenders or The Jeremy Kyle Show – slowly propel the play towards its climax. The women are strong and fairly open minded while the men constantly teeter on the brink of failure. Mrs Haughey (Libby Smyth) is Johnny’s landlady, a character who morphs from a stern busybody to become the play’s comic turn before she stops hovering at the door of her parlour and fades from view. Along the way we meet Joe (Noel McGee) who moved his wife Sylvia (Julie Kinsella) and daughter Christina (Hannah Coyle) from London to Dublin. On the other posher side of the river, fur-coated Alice (Cathy Brennan-Bradley) is also affected by the war. While the menfolk fought side by side, can their families overcome class and ideological differences to remember and honour them together? A mysterious man called Wainwright (James Doran) – who at first I thought was going to be a Russian spy – adds to the intrigue. With a cast of seven, few actors other than Johnny are given the space to develop their characters and shine. The action mostly rotates around two or three clumps of furniture built in different corners of the stage. Director Stephen Beggs makes good use of the space around the audience during the lantern show scene. The play succeeds in exploring the changing mood in Ireland - both just over 100 years ago and today - in relation to the war. 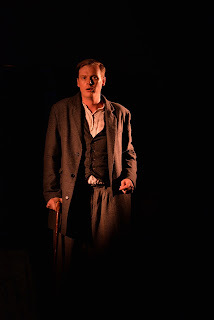 But the relatively short scenes prevented the play building up pace, and while the later twists and turns introduced some tension into the final twenty minutes, ultimately The Lantern Man failed to ignite an electrifying spark that could make the play jump off the page and stage and into my imagination. 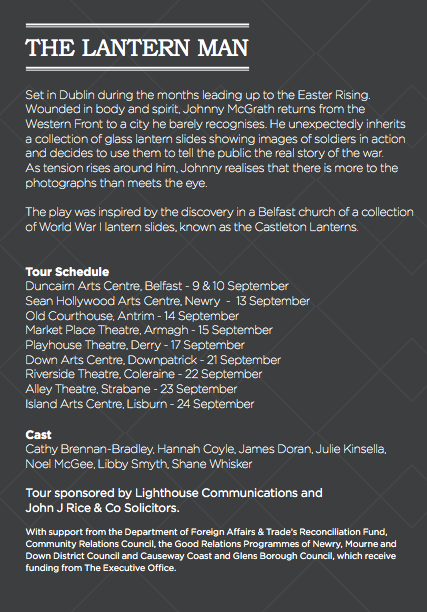 During September The Lantern Man is touring venues in Newry (Tue 13), Antrim (Wed 14), Armagh (Thu 15), Derry (Sat 17), Downpatrick (Wed 21), Coleraine (Thu 22), Strabane (Fri 23) and Lisburn (Sat 24). 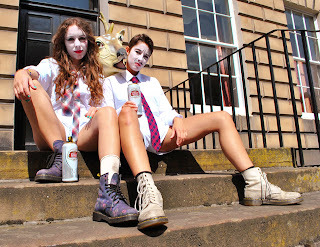 Two white-faced, white-bloused, bare-legged performers wearing Y-fronts over their white shorts and sporting rather long ties and pencilled moustaches sing, dance, mime and speak over an hour set aside to think about what it is like to be a woman. 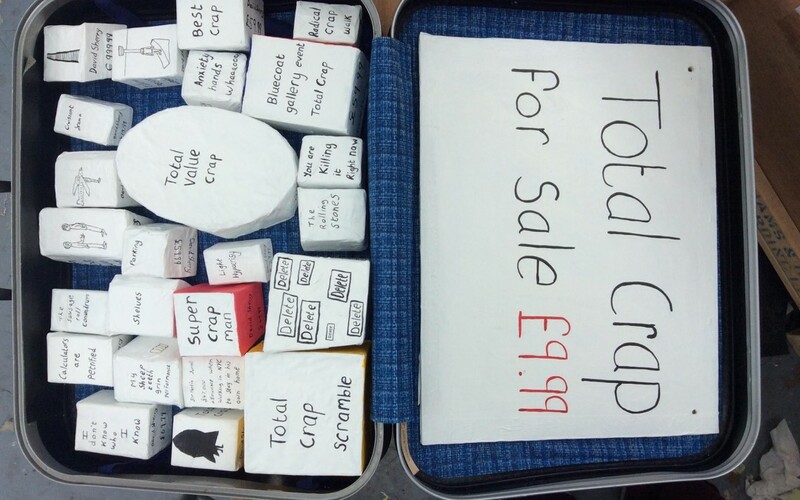 A bit like a certain BBC Radio 4 show with a similar name. While the issues pertain to women, there are often exacerbated by men and really deserve to pertain to society as a whole. There’s an edginess to Women’s Hour and a slight tremble in the bowels of the audience right from the moment we enter the theatre and collect our small gift from Louise Mothersole and Rebecca Biscuit. 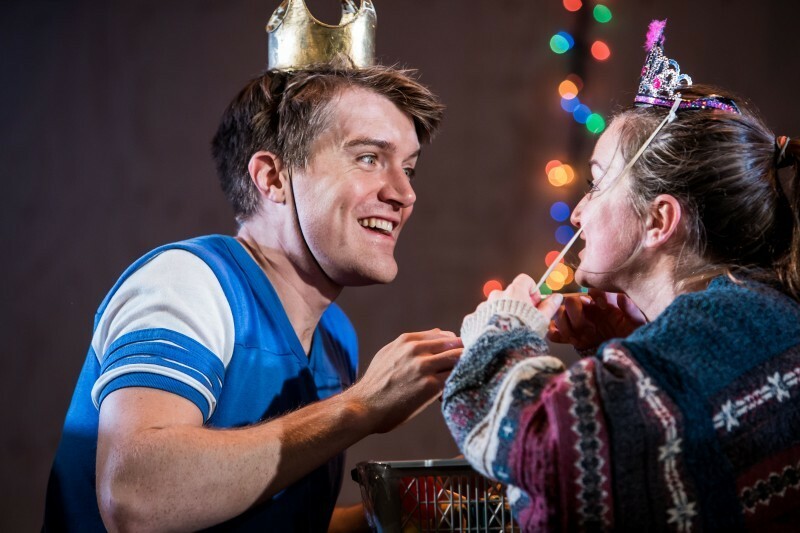 Essentially the show is a collection of interwoven songs, sketches and monologues, some of which repeat and mutate as the show hurtles towards its final applause. The two performers project their satirical critique of feminism from the stage without much need for amplification. We’re reminded that the objectification of women starts young. Even before Barbie dolls and girly confectionary. And then the sexualisation and body image shaming begins. Even before puberty starts. While it’s entertaining to joke about women politicians being asked about their shoes before talking about policy, so often it’s true. Becca and Louise don’t miss the mark when they fire off their humorous reposts. And feminism and feminists don’t escape their spotlight. There are puns aplenty and some actual crumpet is thrown around. Projected images and videos intermittently light up a screen at the back of the stage, a third character on stage that avoids becoming distracting. Adverts are remodelled and song lyrics are adapted to elucidate their inner truth (or inject a more apt message). Some of the best laughs come when the gender specific eggs make their surprising entrance and the cooking of chicken fillets of the silicone variety. Effort had been taken to customise the show for Belfast, with reference to the not so slender local gender thigh pay gap of 27%. While the show has obviously been updated in places since its 2015 Edinburgh Fringe debut, the absence of any mention of the burkini (and the French ban) is another controlling avenue that would have been worth exploring. Monologues are spoken in the dark, removing the zany distractions and (mostly) adding intensity to the words being spoken. Serious points about the world of cinema and marketing are hammered home. The setting of sexually violent Youtube comments to music is powerful and memorable. Women’s Hour is a complex examination of complex issues. Along the way Louise and Becca twirl tampons around in a way I’ve never seen before – but think should become more commonplace – throw crumpet and break all kinds of social taboos by delving into subjects and situations that aren’t spoken about in public. Mostly because it’s not the ‘done thing’ since half the population are obviously totally aware of the topics. Parts of the show were quite uncomfortable to watch and listen to. Let me rephrase that. Parts of the show were quite uncomfortable for me to watch and listen to. But then that’s the point. We don’t have these open conversations … certainly not the ones about ingrowing hairs and pustules. There’s a lot of material packed in and at times the machine gun delivery of some lines leaves it momentarily unintelligible. While a couple of times during the performance the energy levels wane, it does leave space for your brain to process the onslaught of opinion and ideas. With strong language and some very strong imagery, Women’s Hour is a challenging show from Sh!t Theatre. 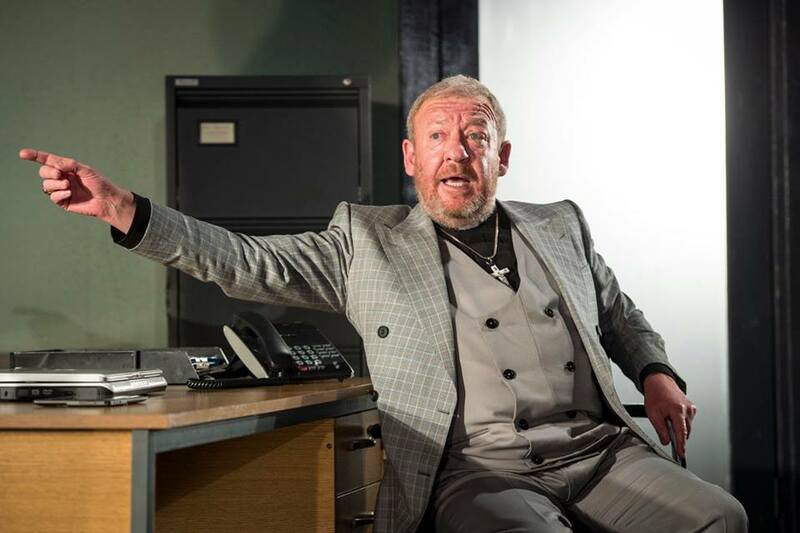 Worth catching the second performance at The MAC on Friday 9 September before the show continues its tour through Manchester, Chichester and Warwick.